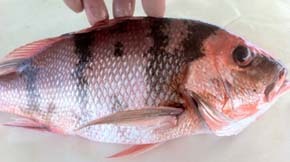 Black discoloration on a dead Red Snapper caught in Gulf of Mexico off Alabama coast. Discolorations also found on other fish such as Vermilion Snapper, Tomtates, Gray Triggerfish and Golden Tilefish. Other problems are fin rot, lesions and lump deformities, some filled with parasites. Image © 2011 by Florida fisherman. Normal Red Snapper without black discoloration. Image © by Atlantic Seafood Market. Reprint April 18, 2012 / May 26, 2011 Milton, Florida, and Baton Rouge, Louisiana - A year ago on April 20, 2010, the BP Deepwater Horizon oil rig blew up killing 11 workers on the platform. Nearly a mile below the rig, the Macondo well erupted. Between that day and four months later at the end of July 2010, at least 206,000,000 gallons of crude oil gushed uncontrollably into the Gulf of Mexico, while 770,000 gallons of Corexit were pumped and sprayed into the Gulf to allegedly “disperse” BP's massive oil slick.